Rendi A. Witular and Hans David Tampubolon, The Jakarta Post, Jakarta, January 30 2013, 9:42 AM. An old phrase says nothing in life is certain but death and taxes. 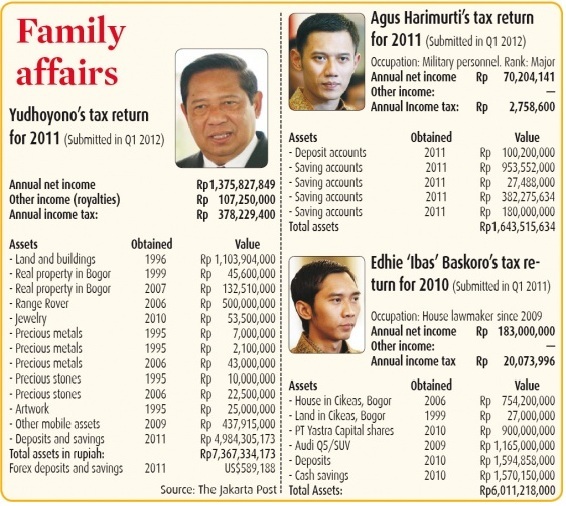 At a time when the nexus of power and wealth is viewed with skepticism, a peek into their tax returns might be expected to reveal the financial affairs of Indonesia’s first family. The tax documents also revealed that Agus opened four different bank accounts and a deposit account totaling Rp 1.63 billion. There was no information in the documents as to how the additional income was earned as the section for extra income —including that of his wife, fashion model Annisa Pohan— was left blank. Agus has been listed as a taxpayer since 2007, but had not submitted a tax return until 2011. Ibas explained on behalf of his brother that based on the law only high-ranking military officers were obliged to submit wealth reports. According to Ibas’ 2010 tax return, he earned Rp 183 million as a Democratic Party lawmaker. He also had an investment worth Rp 900 million with PT Yastra Capital, a cash deposit amounting to Rp 1.59 billion and cash equivalents of Rp 1.57 billion. This entry was posted in Politik and tagged Agus Harimurti, Annisa Pohan, Edhie 'Ibas' Baskoro, Fuad Rahmany, Hatta Rajasa, Jukian Pasha, Kostrad, KPK, Susilo Bambang Yudhoyono, tax returns. Bookmark the permalink.